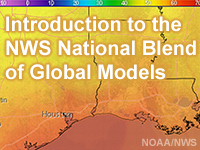 The National Blend of Global Models was developed to utilize the best available science and provide a consistent National Weather Service forecast product across the U.S. This lesson describes the background and motivation for the National Blend and includes comparisons of Blend forecasts with current guidance. The lesson also offers a short summary of future plans and training related to the National Blend. The course description should clarify the target audience of this lesson. I was interested in this topic as a Skywarn observer, but it contained too many undefined acronyms and assumed too much prior knowledge to be useful to me. I am sure it would be valuable to weather professionals. I have taken several MetEd classes that were very useful to me, so please do not consider this to be a complaint, just an explanation of my survey answers. This is a nice overview of some fairly big changes to how grids are produced. I did find it troubling that the ECMWF model is fully excluded from the project. Provides basic info but not as good as other COMET modules.